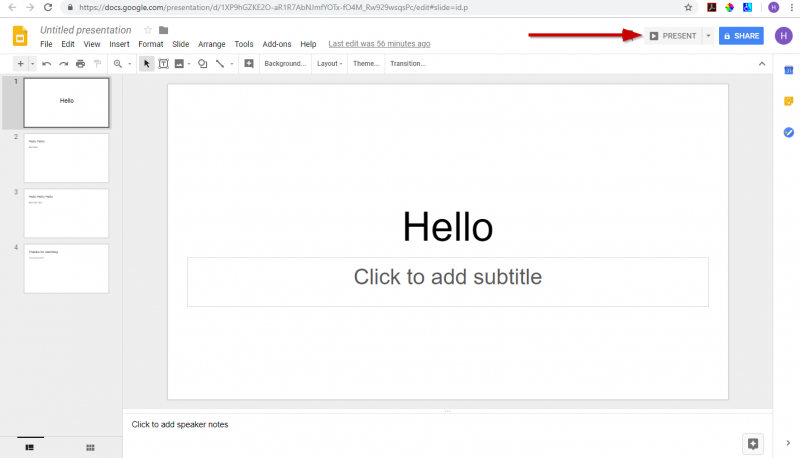 Google recently introduced a new feature: automatic captioning during Google Slides presentations. This feature uses the computer's microphone setting to record audio and automatically generate captions in real-time at the bottom of the screen. This can help your presentation be accessible for all students, especially those who are deaf, hard-of-hearing, or non-native speaking. Because Google Slides uses the audio from a microphone, this can also be helpful when presenting in noisy or ambient environments. Note: To help with caption accuracy, use an external microphone for your speaker. Be aware that captions in Google Slides do not include punctuation. 1. Open your presentation in Google Slides. 2. Click on "Present" in the top right corner of the screen. 3. From the toolbar at the bottom of the screen, click on the CC icon to turn on automatic captioning. 4. As you speak, you will see captions appear at the bottom of the screen. Note: Automatic captioning is only available in Google Chrome.